To develop, acquire, lease and manage quality properties while maintaining relationships of integrity. To execute our mission in a manner which exceeds client expectations in both the level of service we provide and the quality of our work. The Cherokee word “INKANA” means, “I am a friend of his, he is a friend of mine.” This is the cornerstone on which our company was established. 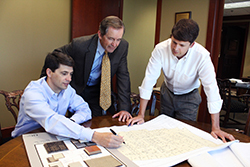 Founded in 1997 and based in Birmingham, Alabama, Inkana Healthcare Development is a fully integrated commercial real estate firm that specializes in providing real estate services for complex projects. We assist clients in achieving their strategic, financial and operational goals. Whether it is a third party facility management assignment or the off-balance sheet ownership of a real estate asset, Inkana Healthcare Development allows clients to free up resources committed to "bricks and mortar" and infrastructure.